Is it a phone? Is it a camera? The Samsung Galaxy S4 Zoom has been officially unveiled and while its existence is no surprise considering the amount of rumours which have been circulating, the sheer number of Galaxy S4 branded handsets Samsung seems to be forcing on the world is a little more alarming. From the front (or is that the back?) the Galaxy S4 Zoom just looks like another S4 handset, but flip it over and everything gets distinctly Samsung Galaxy Camera all of a sudden. That camera is a 16MP offering complete with 10x optical zoom - usually we are lumped with a rubbish digital zoom on smartphones - but that lens adds quite a considerable bulk to the device, which measures 125.5 x 63.5 x 15.4 mm and weighs in at 208g. 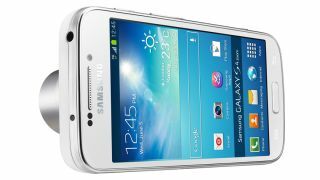 Back to the phone side of things and the Galaxy S4 Zoom features a 4.3-inch qHD display, 1.5GHz dual-core processor, 1.9MP front facing camera, Android 4.2 Jelly Bean and 8GB of internal storage - although only 5GB will be available for you to use. Luckily there is a microSD slot so you can expand on the paltry internal offering, plus there's a 2330mAh battery and various connectivity options including 4G, Wi-Fi, Bluetooth 4.0, GPS and NFC. Samsung has confirmed that the Galaxy S4 Zoom will be available this summer in the UK, although the exact date and price will be revealed at a later date. There's currently no world on other territories, but we're pushing the Korean manufacturer for more details. We'll be getting to grips with this questionable smartphone at Samsung's June 20 event in London, but if you can't wait until then for a Samsung Galaxy S4 Zoom review a Russian site has already got its mitts on it.